Summer Bucket List, Strawberries and Oh Canada! Now that summer's here, we're finding our weekends busier than ever. Between Birthday parties and barbeques, weddings and work commitments, our calendar is very quickly filling up. Even though our LO was around last summer, she was too tiny to do any of the fun kid activities, and with the heat and sun, it was unsafe for her to be outdoors. This year, there are so many things we want to do as a family! To ensure we didn't neglect our own family desires while maintaining our previous commitments, we decided to create a Family Summer Bucket List (blog post coming) outlining all the activities and events we want to do this summer. Personally, I think this is a great idea all year round and if it works, maybe we'll adapt it! Most of the family bucket list items are inexpensive and just require a few hours. Plus there are so many wonderful festivals and activities happening in the City of Toronto and neighbouring communities that we rarely take advantage of. Best of all, it's perfect family time. Last weekend we promised ourselves to make the long weekend a family-filled one. And we made good on that promise. In addition to going to RibFest on Saturday night with our best friends, we also checked Strawberry Picking off the list! There are so many strawberry patches in and around the GTA and York Region. We opted to visit Whittamore's Farm in Markham and we weren't the only ones. The farm was packed with those wanting to Pick their Own, as well as visit the market and play in the activity zone. The strawberry fields were full of bright red berries. We stocked up on a full 8L bucket, and sampled quite a few in the field too. There's nothing quite like fresh, locally grown strawberries. They're full of flavour and sweetness! When we got home and washed the berries up, I thought of the perfect Canada Day treat to use up some of our fresh berries. 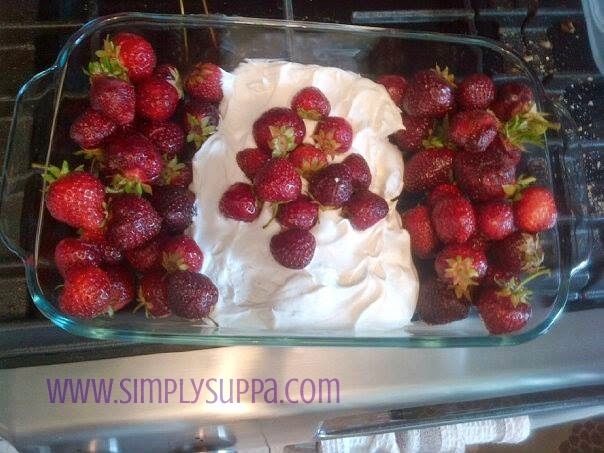 I stopped in at the supermarket and picked up a tub of Cool Whip and voila! I'm no baker, but this dessert was loved by all! Fresh, sweet berries bursting with taste and cool whipping to dip into - a perfect summer dessert. As you can tell, I didn't even trim off the greens or cut the berries - I kept them in their natural, beautiful form. Happy Canada Day everyone! I hope you had a wonderful long weekend with your family. We are truly blessed and lucky to be living in such a wonderful country.